Tassinari, M. G. (2012). Evaluating learner autonomy: A dynamic model with descriptors. Studies in Self-Access Learning Journal, 3(1), 24-40. Every autonomous learning process should entail an evaluation of the learner’s competencies for autonomy. The dynamic model of learner autonomy described in this paper is a tool designed in order to support the self-assessment and evaluation of learning competencies and to help both learners and advisors to focus on relevant aspects of the learning process. The dynamic model accounts for cognitive, metacognitive, action-oriented and affective components of learner autonomy and provides descriptors of learners’ attitudes, competencies and behaviors. It is dynamic in order to allow learners to focus on their own needs and goals. The model (LINK) has been validated in several workshops with experts at the Université Nancy 2, France and at the Freie Universität Berlin, Germany and tested by students, advisors and teachers. It is currently used at the Centre for Independent Language Learning at the Freie Universität Berlin for language advising. 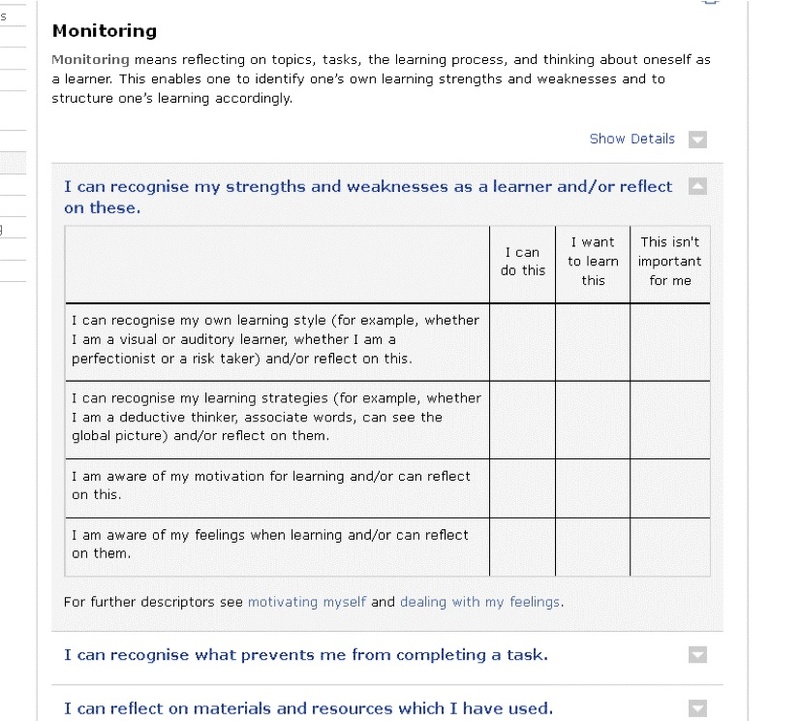 Learners can freely choose the components they would like to assess themselves in. Their assessment is then discussed in an advising session, where the learner and the advisor can compare their perspectives, focus on single aspects of the leaning process and set goals for further learning. The students’ feedback gathered in my PhD investigation shows that they are able to benefit from this evaluation; their awareness, self-reflection and decision-making in the autonomous learning process improved. 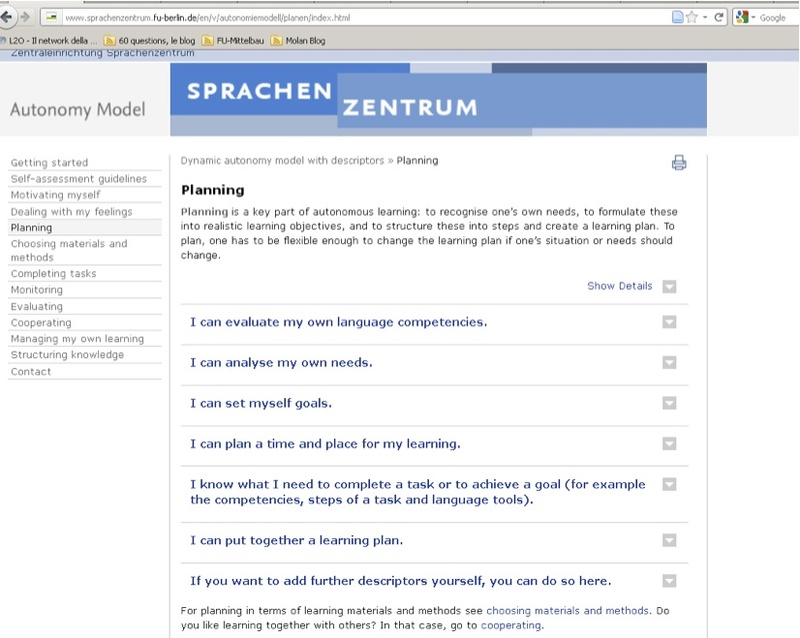 What are the aims of language learning advising for learner autonomy? In my experience as director of the Centre for Independent Language Learning (CILL) at the Freie Universität Berlin and as an advisor, I am confronted with this question daily. Surely, the answers may be different in different institutional contexts, but I think most advisors would agree on this: the aims of advising are both supporting (self-directed or autonomous) language learning processes and helping learners to develop their competencies for learner autonomy for life-long learning. Key elements of language learning advising are awareness raising, reflection and learners’ empowerment (see Carette & Castillo, 2004). But how can this be tangibly achieved? What methods and tools can be useful for it? And how can a balance be found between the focus on language learning and the focus on learning to learn? Furthermore, will varied approaches be needed for different languages or is a general approach possible? I have reflected on these questions while setting up the CILL at the Freie Universität Berlin, and to some of these questions I have devoted my PhD project on “Learner autonomy in foreign language learning: components, competencies and strategies” (Tassinari, 2010). As a result of this research I have designed a dynamic model for learner autonomy, with descriptors for attitudes, competencies and learning behaviors. This model allows a qualitative and dynamic approach to self-assessment and to the evaluation of learner autonomy. The aims of this paper are to describe the dynamic model and to illustrate how it can be used in language advising. I will start by briefly describing the context and the methodology of my investigation; then I will define learner autonomy and illustrate the dynamic model and the descriptors. Next I will reflect on self-assessment and evaluation of learner autonomy, and define my qualitative approach to it. After that, I shall illustrate the steps for self-assessment and evaluation as practiced in the language advising service at my university. Finally I will discuss some students’ feedback on this experience and include my own reflections. The dynamic model of learner autonomy is the result of my PhD investigation. The aims of my research were both to give a systematic and operational definition of learner autonomy and to develop a description of learners’ competencies and skills (see Benson, 2001) as a tool for supporting autonomous processes in learning and teaching foreign languages in higher education contexts. My definition of learner autonomy is based on the critical analysis of existing definitions, from Holec (1981) to Dickinson (1987) Little (1991), Littlewood (1996 and 1999) and Benson (2001), to mention just some of the most relevant ones, with the purpose of identifying both crucial components of learner autonomy and cues for the descriptions of learners’ competencies, attitudes and learning behaviors. Finally the dynamic model and the descriptors have been tested with students of the Freie Universität Berlin, both at the CILL and in classroom settings (see Tassinari, 2010, chap. 8). In the literature there is no consensus on the question of whether the assessment of learner autonomy is possible or not (see Benson, 2010). Sheerin (1997) suggests that every autonomous learning process should begin with an assessment of the learner’s disposition for and capacities of learner autonomy, in the form of, for example, an interview or a questionnaire. However, this raises questions as to what kind of assessment can take place, which criteria should be taken into account, and how it might be possible to assess learner autonomy from an external perspective. Self-assessment is therefore meant to be part of the evaluation process, i.e. of the pedagogical and formative process which takes place – or should take place – in supporting autonomous learning processes. The key elements of evaluation – reflecting, awareness raising and preparing the ground for decision making – are also key elements in language advising (see Carette & Castillo, 2004). Looked at that way, the evaluation of learner autonomy brings several advantages. For the learner it brings reflection on and an awareness of one’s own competencies, and can therefore contribute to improving and regulating their learning process. For the advisor it helps them to identify the strengths and weaknesses of the learner and to spot areas in which support is needed. In the next sections I will describe how the dynamic model and the descriptors can help to support this process. a social component (learning and negotiating learning with partners, advisors, teachers…). An essential characteristic of learner autonomy is the capacity of the learner to activate an interaction and a balance among these dimensions in different learning contexts and situations. The dynamic model of learner autonomy sums up these components in terms of learners’ competencies, skills, choices, and decision-making processes, and accounts for their mutual relationships (see Figure 1). In addition, ‘can-do’ statements describe in detail learner’s competencies, skills, and behaviors (see Figure 2, 3 and 4 for some examples). The components of the dynamic model are spheres of competencies, skills, and actions. 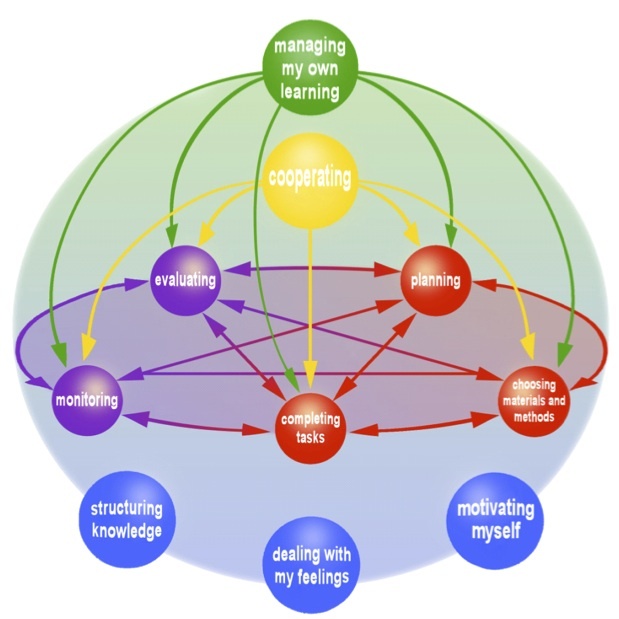 They are expressed by verbs, in order to focus on their action-oriented and process-oriented character: ‘structuring knowledge’, ‘dealing with my feelings’, ‘motivating myself’, ‘planning’, ‘choosing materials and methods’, ‘completing tasks’, ‘monitoring’, ‘evaluating’, ‘cooperating’ and ‘managing my own learning’. There is no hierarchy among these components, except for ‘managing my own learning’, which summarizes all other components and superordinates them, therefore delivering a general overview of the complex construct of learner autonomy. This model is both structurally and functionally dynamic. It is structurally dynamic, because each component is directly related to all the others (as shown by the arrows in Figure 1). It is functionally dynamic, because learners can decide to enter the model from any component and move freely from one component to another without following a given path, according to their needs and purposes. They can, for example, start with ‘planning’ if they would like to focus on this aspect of the learning process, and then move to ‘evaluating’, or to ‘motivating myself’ or to any other component they want to reflect on. This dynamic is an essential characteristic of the model, and makes it possible to account for the complexity of learner autonomy. On the internet version of the dynamic model the interrelationships among the components and/or the descriptors are represented by hyper-textual links (see http://www.sprachenzentrum.fu-berlin.de/v/autonomiemodell). Three dimensions can be identified in the dynamic model: a predominantly action-oriented dimension (‘planning’, ‘choosing materials and methods’, ‘completing tasks’, ‘monitoring’, ‘evaluating’, ‘cooperating’, ‘managing my own learning’), a predominantly cognitive and metacognitive dimension (‘structuring knowledge’), and a predominantly affective and motivational dimension (‘dealing with my feelings’, ‘motivating myself’). In addition, a social dimension (‘cooperating’) is integrated into each component. However, a distinction between these dimensions is merely theoretical. In learning and teaching processes, all these aspects are closely interrelated. Decision-making about one’s own learning involves cognitive aspects (e.g. knowing about alternatives), metacognitive aspects (evaluating each alternative), affective aspects (considering one’s own interests and motivation); carrying out learning tasks involves an action-oriented, a cognitive, a metacognitive and an affective dimension (being able to achieve a task, to activate the knowledge requested by the task, to reflect on this, to take into account one’s own feelings). Nevertheless, this distinction is useful for empirical and pedagogic purposes, since it makes it possible to break down this complex metacapacity into different competencies and groups of skills and strategies, so that learners and advisors can better reflect on them and enhance them in concrete learning situations. Each component of the dynamic model entails a set of descriptors which give specific statements of individual competencies, skills and learning behaviors of learners. They are formulated as ‘can-do’ statements and they are distinguished in macro-descriptors – general descriptions which serve for an initial orientation of the learner in the self-evaluation process – and micro-descriptors, more detailed descriptions through which the learner can differentiate their skills, behaviors, and attitudes, and thus assess their learning more precisely. Together, the descriptors (118 in total, with 33 macro-descriptors and 85 micro-descriptors) constitute a checklist which covers the main areas of autonomous language learning. Some examples of descriptors are shown in Figure 2, 3 and 4. The complete checklists are available online. In order to make the description manageable in different learning situations (e.g. in classroom learning, in self-directed learning, in informal learning), the descriptors do not refer to specific situations or to specific languages. However, even if they are not contextually bound, they are formulated for and tested within the context of language learning in higher education. These descriptors are not intended to be exhaustive nor to be normative. They do, however, offer a wide spectrum of competences in order to serve as a tool for raising learners’ (and advisors’) awareness of what could be worth focusing on in autonomous learning processes. Unlike descriptors for language skills, these descriptors are not scaled, since there is no consensus in the researching community on levels of learner autonomy. However, micro-descriptors offer some differentiation (see the examples for ‘planning’ and ‘monitoring’ in Figure 3 and 4) in order to account for diverse or partial competences and/or for different learning styles. A prerequisite for the evaluation of learner autonomy is the willingness of the learner to undertake it. Experience shows that it is advisable to propose, rather than impose self-reflection (see for example the feedback of student M.M. in Tassinari, 2010). Learners are different; whereas some ask for a systematic approach and a reflection on their own current status before starting a learning process, others just want to start learning. In addition, some learners are willing to focus on their own learning competencies while others prefer to focus on actually learning the language. The decision whether, when and to what extent this evaluation can be done, should be made by the learner; the advisor can/should merely support it. In the following, I shall briefly describe the steps of this evaluation process, which I have defined during my investigation and I still adopt in the language advising service at the CILL at my university. The first step in the evaluation process is eliciting the learners’ previous experience with autonomous language learning and their beliefs. Therefore, learners are asked to briefly describe their perceptions of autonomous language learning and their experience in this field. If learners already have some experience then they can describe its nature, strengths and shortcomings. This reflection can be done either by the learners themselves before the advising session with the help of the questions in the ‘Getting started’ section (http://www.sprachenzentrum.fu-berlin.de/en/v/autonomiemodell/einstieg/index.html), or together with the advisor during the advising session. In the advising session it can be very constructive in any case to devote a few minutes to this topic, so that both the learner and the advisor can ask questions, if need be. Moreover, my experience shows that recalling previous learning experiences can be very useful both for the learner and the advisor. Learners can reflect on positive and effective learning situations, tasks or strategies they have already experienced; the advisor can obtain useful information from this in order to ask questions, to make careful suggestions and to generally support the learners in their learning process. For the reflection process to be successful it is crucial that learners decide for themselves what aspects of their learning process they would like to reflect on. According to their priorities, needs, goals or interests, they can choose either one or more components. For each component they can pick the descriptors they find relevant for their learning process. This freedom to choose the component(s) and/or the descriptors is a first step in raising awareness about the learning process, because, by choosing these learners have to explicitly reflect on which aspects they want to focus on at the very moment of the self-assessment, and therefore become aware of these aspects. 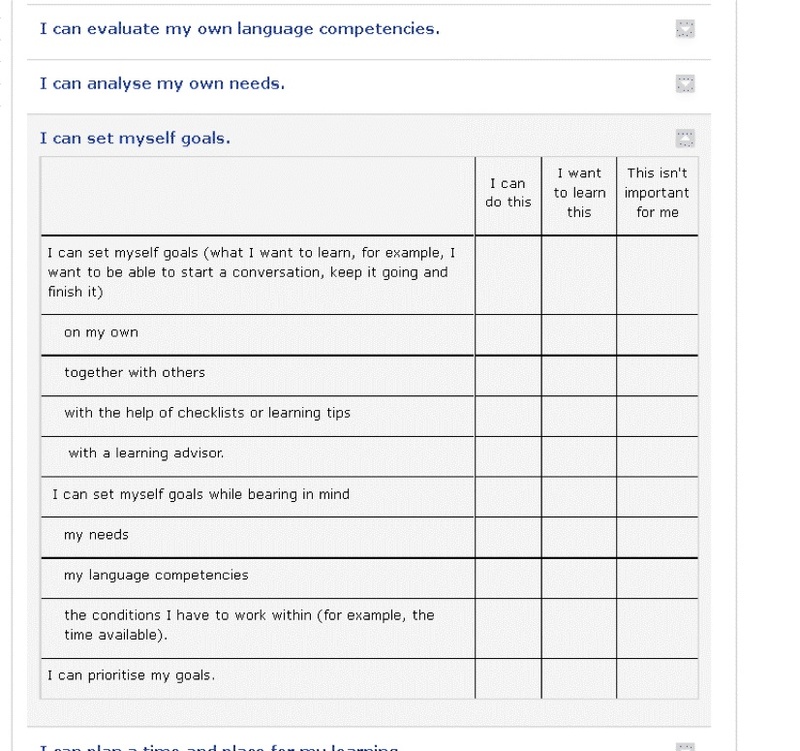 Coming to the self-assessment itself, learners can tick for each descriptor one of three different answers (see Figure 3 and 4): ‘I can’, ‘I want to learn this’, or ‘This isn’t important for me’. In addition, they can use some blank lines at the end of each component in order to formulate their own descriptors, if they wish. Learners can undertake this self-assessment alone, outside the advising session, in a familiar environment helping them to feel more comfortable and giving them more time to reflect. Once this step has been concluded, the results can be discussed with the advisor. The next step in the evaluation process is to discuss the learner’s self-assessment with the advisor. This session is the core of the evaluation process and is a pedagogical dialogue, which allows both the learner and the advisor to reflect together by comparing each other’s perspectives on the learner’s competences and on the learning process. This dialogue is conducted following the basic rules of advising: the advisor listens to the learner, asks questions for clarification, asks for details, reformulates the learner’s statements, sums up, helps them focus on priorities, and asks for next steps (see Kelly, 1996). This dialogue is crucial for the evaluation, because, as was noticed above (see Premises: self-assessment and evaluation of learner autonomy), experience shows that self-assessment is very challenging, not only in language learning, but also in many other fields. If left to their own devices, learners often tend to overestimate or to underestimate themselves (see Kleppin, 2005). Moreover, they find it more difficult to define criteria for assessing their own competencies in different situations. The descriptors offer learners a first opportunity to let their inner perspective interact with an external perspective on autonomous language learning. But it is in a real dialogue between the learner and the advisor – or the learner and the teacher, or the learner and their co-learners – that this interaction can really unleash its potential for the evaluation process. Both my investigation and my experience as a language advisor show that advising sessions following a learner’s self-assessment are very fruitful (Tassinari, 2010). Learners generally appreciate the fact that they can reflect deeply and free from constraints on themselves as learners; they independently initiate topics for discussion, they obtain new insights into their learning competencies and attitudes, they become more aware of their learning choices and are able to make decisions for themselves regarding their future learning. At the end of the evaluation process learners should be able to make decisions for further learning. For instance, they should be able to decide to try new tasks or new strategies, to join a learning group or to look for a tandem partner. They may also decide to leave the course they are enrolled in, in order to work more directly on their specific needs. This capacity for making reflected decisions (Holec, 1981) is both one of the aims and the result of the evaluation process. This point should be emphasized because this evaluation, both as a qualitative and a formative evaluation, and the learner’s awareness of their learning process activate metacognition and constitute therefore a crucial aspect in the autonomous learning process. Of course, this evaluation process is recursive: it can be started more than once at different moments in the learning process, each time with a different focus and with different outcomes. This is why the proposed model of learner autonomy is dynamic; each learner at different moments of their autonomous learning process should find some stimuli there for reflecting on their own learning. This autonomy model allows a qualitative approach to the evaluation of learner autonomy, not a quantitative one: meaning the descriptors are not provided with a numeric answer system, for various reasons. First of all, giving a numeric score to the different answers would imply a hierarchy among the components and the descriptors. This would severely compromise the learner’s ability to freely choose the components and the descriptors they would like to reflect on. Moreover, a scored test is not advisable from a pedagogical point of view, since it could give learners the false impression that there is a full score to reach. On the contrary, the aim of this evaluation is not to measure learner autonomy, but rather to enhance the awareness of and the reflection on one’s own strategies and learning process. On the way to learner autonomy there is no full score to reach. There are many ways to go and each learner can find their own way according to their needs, priorities, attitudes and personal experience. The majority of the students who took part in my inquiry (see Tassinari, 2010, chap. 8) gave me positive feedback on the self-assessment with the dynamic model. Many of them stressed the fact that the self-assessment gave them impetus for self-reflection, increased their awareness of their own learning processes and helped them to focus on goals in order to improve their learning. Some students additionally stressed that the dynamic model and the descriptors gave them an overview of different opportunities, forms, methods, and strategies for autonomous language learning. This feedback has been confirmed by many other students I have advised since the end of my investigation. Among the difficulties students identified in their autonomous learning process are discontinuous motivation, self-assessment of language skills, the choice of suitable materials, planning, and time management. Since the investigation was run on a small scale, it is not advisable to draw too general conclusions from these remarks. Nevertheless, the topics addressed seem to be crucial aspects of autonomous learning processes and are surely worthy of further investigation. The results of my investigation show that the self-assessment and the evaluation of the learners’ competencies, attitudes and behaviors in an autonomous learning process are very useful both for learners and advisors in order to reflect and to regulate the learning process itself. The dynamic model and the descriptors are a valid tool in order to support this evaluation process, to foster awareness, reflection and decision-making. Nevertheless, the evaluation process should be integrated within a pedagogical dialogue, allowing the learner to compare their perspective with that of the advisor and/or of their peers. Within a pedagogical frame explicitly aiming at learner autonomy, it is therefore the task of the advisor to create settings and practices that enhance this reflection, while taking into account the learner’s needs and attitudes. Maria Giovanna Tassinari established the CILL at the Freie Universität Berlin and has run it since 2005. Her research interests are learner autonomy, advising and multilingualism. Her PhD on “Learner autonomy in foreign language learning: components, competencies, strategies” was awarded in 2011 with the Bremer Forschungspreis des AKS (Arbeitskreis der Sprachenzentren). Benson, P. (2010). Measuring autonomy: Should we put our ability to the test? In A. Param, & L. Siercu (Eds. ), Testing the untestable in language education (pp. 77–91). Bristol: Multilingual Matters. Carette, E., & Castillo, D. (2004). Devenir conseiller: Quels changements pour l’enseignant? Mélanges CRAPEL, 27, 71–97. Dam, L. (Ed.) (2001). Learner autonomy: New insights/Autonomie de l’apprenant: nouvelles pistes. Special Issue AILA Review 15. Dam, L., & Legenhausen, L. (2010). Learners reflecting on learning: Evaluation vs testing in autonomous language learning. In A. Param, & L. Siercu (Eds. ), Testing the untestable in language education (pp. 120–139). Bristol: Multilingual Matters. Flick, U. (2000). Qualitative Forschung: Theorie, Methoden, Anwendung in Psychologie und Sozialwissenschaften. Reinbek bei Hamburg: Rowohlt-Taschenbuch-Verlag. Holec, H. (1981). Autonomy in foreign language learning. Oxford: Pergamon. Little, D. (1991). Learner autonomy 1: Definitions, issues and problems. Dublin: Authentik. Littlewood, W. (1996). Autonomy: An anatomy and a framework. System, 24(4), 427–435. Littlewood, W. (1999). Defining and developing autonomy in East Asian contexts. Applied Linguistics, 20(1), 71–94. Kelly, R. (1996). Language counselling for learner autonomy: The skilled helper in self-access language learning. In R. Pemberton, E. S.L. Li, W. W.F. Or & H. Pierson (Eds). Taking control: Autonomy in language learning (pp. 93–113). Hong Kong: Hong Kong University Press. Kleppin, K. (2005), Die Förderung der Fähigkeit zur Selbstevaluation beim Fremdsprachenlernen. In: Burwitz-Melzer, Eva & Solmecke, Gert (Eds.) Niemals zu früh und selten zu spät: Fremdsprachenunterricht in Schule und Erwachsenenbildung. Festschrift für Jürgen Quetz (pp. 107–118).. Berlin: Cornelsen. Martinez, H. (2008). Lernerautonomie und Sprachenlernverstädnis. Eine qualitative Untersuchung bei zukünftigen Lehrerinnen und Lehrern romanischer Sprachen. Tübingen: Narr. Oxford. R.L. (2003). Toward a more systematic model of L2 learner autonomy. In: D. Palfreyman & R. C. Smith, (Eds.) Learner autonomy across cultures (pp. 75–91). Hampshire / New York: Palgrave Macmillan. Rivers, W. P. (2001). Autonomy at all costs: An ethnography of metacognitive self-assessment and self-management among experienced language learners. The Modern Language Journal, 85(2), 279–290. Sheerin, S. (1997). An exploration of the relationship between self-access and independent learning. In P. Benson & P. Voller (Eds.) Autonomy & independence in language learning (pp. 54–65). London: Longman. Sinclair, B. (1999). Wrestling with a jelly: The evaluation of learner autonomy. In B. Morrison (Ed.). Experiments and evaluation in self-access language learning (pp. 95–109). Hong Kong: Hasald. Tassinari, M. G. (2010). Autonomes Fremdsprachenlernen: Komponenten, Kompetenzen, Strategien. Frankfurt am Main: Peter Lang. Wenden, A. L. (1991). Learner strategies for learner autonomy. Hemel Hempstead: Prentice Hall. Wenden, A. L. (Ed.) (1999). Metacognitive knowledge and beliefs in language learning. System 27(4), 435-441. Although the difference between autonomous language learning and self-directed language learning may be relevant in research and in some learning contexts, in this article I will mostly be using these terms synonymously. See Tassinari (2010: 122) for a discussion of the difference between self-directed language learning as referring to a mode of learning and autonomous language learning as referring to the capacity of the learner to reflect independently and control to some extent their learning process in different learning situations and contexts. This definition results from the critical analysis of existing definitions, which elicited core aspects of learner autonomy, components of learner autonomy, contextual aspects and possible degrees in learner autonomy (for more references see Tassinari, 2010, chap. 3; Holec, 1981; Dickinson, 1987; Little, 1991; Littlewood, 1996 and 1999; Benson, 2001; Oxford, 2003; Martinez, 2008). The following definition focuses on learners’ general competencies in different learning contexts and situations. For the importance of metacognition in autonomous language learning see Wenden, 1991 and 1999 and Benson, 2001: 86–98.